As PPS prepares for Placemaking Week 2017 in Amsterdam—along with our partners Stipo, The City at Eye Level, Placemaking Plus, and Pakhuis de Zwijger—we’re more inspired each day by this city’s unique mix of history and cultural innovation, and with the seemingly countless number of place-focused initiatives that are taking place throughout the region. Amsterdammers have been doing placemaking for years, and for us, it's a huge part of what makes the city so lively and full of creative energy. Project for Public Spaces has a long history of working with the planning department and district managers of this great city, and we're excited to return. Housed in a former refrigeration warehouse, the Pakhuis is a great example of the kind of adaptive re-use practices for which the city has become well known. Another stunning example of a formerly vacant building turned multi-use destination in Amsterdam is Lola Lik—a former prison complex, called Bijlmerbajes, which has become a vibrant public space where refugees can share skills, co-create, and meet their neighbors. Since crime rates have fallen so low in the Netherlands, many of the country's large prison complexes are no longer in operation. The Bilmerbajes is one of four prisons that closed last year, and while the building will eventually be torn down, in 2016 the City of Amsterdam decided to transform the empty site into a creative cultural hub, offering 100,000 square feet of space for art studios, start-ups, offices, and language schools. Beyond this, given the high population of refugees from Syria, Eritrea, Iraq, and Afghanistan living in nearby refugee center Wenckebachweg, the space also offers opportunities for these new Amsterdammers to meet, mingle, and gain valuable work experience while learning from each other. In fact, as a prerequisite for renting a spot at the incubator site, potential lessees must demonstrate the contribution they will make to refugees and/or the surrounding neighborhood. This city-led approach to cultivating social integration is just one example of what has become known as “the “Amsterdam approach”—a cooperative policy framework that encourages activities that help connect new refuges with the city and its residents. 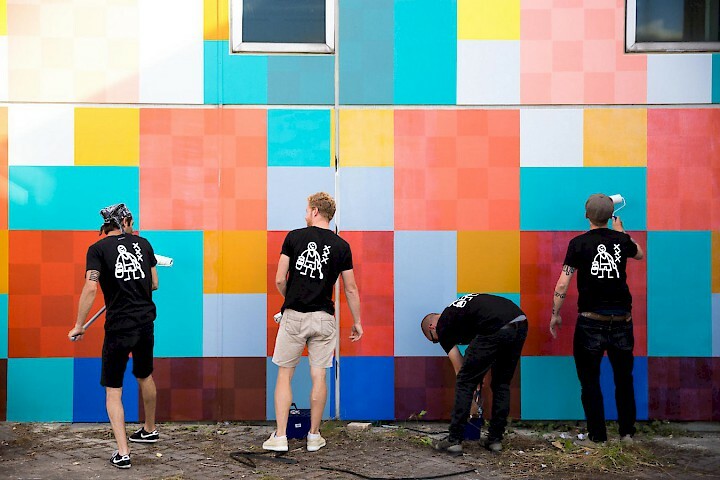 In Dutch, “lik” is a slang term that means both “prison” and a “lick of paint.” People have been adding their own “liks” to the building since the project’s start, while global art foundation, Favela Painting (pictured above), has also collaborated with refugees to create colorful murals on the once-gray prison building | Image via Lola Lik. With innovative policies geared towards social inclusion and opportunity for its large and quickly growing refugee population, Amsterdam is indeed leading the way in place-led development and city making. At the same time, the city and its residents show a deep understanding of the ways in which multiple causes—from public health and sustainability to smart design and social inclusion—converge around the idea of place, even on a very small scale. Indeed, many of the region’s most exciting placemaking initiatives have been hyper-local and resident-led. One of our favorite examples of “Lighter Quicker Cheaper” interventions is the Amsterdam-born initiative BenchesCollective (BankjesCollectief), which aims to create more friendly, social, and spontaneous public space through the simple use of … benches! Boasted as the largest outdoor café in the world, BenchesCollective (or BankjesCollectief) takes over benches across the world every first Sunday of the month and invites people to host cafés and activities. As part of the project, participants can visit the BenchesCollective website, pin their location, advertise their hours of operation, and include a description of the menu or activities to be hosted at their bench. BenchesCollective inspires residents to create a public space from scratch. What a great way to get to know your neighbors! The idea behind the BenchesCollective initiative is to spark public interactions that might not otherwise take place. It provides space for strangers to sit down together and share in a conversation. It also encourages the hosts and guests of the benches to rethink the use of streets and urban furniture while giving them a degree of ownership over their own public spaces. These monthly events elevate the importance of streets and benches from pure utility to places of experimentation, community engagement, and placemaking. Since the project began in 2014, over 1000 benches have opened in 17 countries. These are just a few examples of the wide-ranging and exciting placemaking initiatives that are taking place throughout Amsterdam, and which we will explore in more detail in the coming months. This October, as part of the Placemaking Week experience, participants will have the opportunity to visit many of these sites and to attend a selection of curated side events that will extend beyond the core two-day conference. To help us take full advantage of Amsterdam’s many great places, people, and organizations—as well as the global community of placemakers the event will convene—these activities will include networking events, hands-on workshops, and guided tours of the waterfront activities, public spaces, and placemaking projects in and around Amsterdam. And don't forget, there are only four days left until the April 28 deadline to submit a proposal to present at Placemaking Week 2017! Start your online application here, and visit the conference website for more details.